ANYTHING THAT MAKES saltwater fly fishing easier gets my attention, and when Keith Tennant, a tarpon guide from Venice Florida, showed me this deal three years ago, I could see the tremendous potential, and refined Keith’s original idea a bit to come up with the “Ultimate Stripping Basket” for your boat. Using a stripping basket might not appeal to everyone, and it certainly didn’t to me in the beginning. Every one I saw, I hated, as it was such a pain to use. There are some commercial stripping baskets like the “Line Tamer” on the market, and I’ve tried this one but it has three faults — it is too high, too narrow, and it cannot be collapsed for storage. Keith showed me his “Leaf bucket” and I asked him where he bought it, and his answer surprised me — Target! For twelve bucks! This is designed to be used as a leaf collector for gardeners — a container to stuff leaves, plants or other trash into. The top of the leaf bucket is covered but has a slit in it, so that the leaves won’t blow out, and straps or handles that allow you to haul it around. The tricky part about these leaf buckets, and what makes them so desirable for a boating angler, is that they are collapsible, using fiberglass wands to make them spring to life, much like one of the new small backpacking tents. Look for your leaf bucket at Target or K-Mart. Both of these stores carry them. (Editor’s note: Shortly after this article was written, Target and K-Mart stopped carrying collapsible leaf buckets. However you can still purchase them at garden supply stores or online at Web sites like Fiskars 9405 Kangaroo 30-Gallon Gardening Container .) The first thing you want to do is to get a sharp pocketknife or a single edge razor blade and CAREFULLY remove the top. This is just a matter of cutting all the stitching. Then cut off and remove all the handles, straps and other junk to make it totally clean of anything that might hang up your line and cost you a 100 lb. tarpon! The one big problem I could see that needed to be addressed was getting some weight in the base, so it didn’t just blow off the deck of your skiff with the slightest breeze! Keith solved this by putting a plastic tube in the base filled with lead “egg” sinkers. Now, this did the job but as I found out, fishing with Keith that day, your running line could get jammed under the tube with the lead weights and this cost me a good shot at a nice tarpon when the last 20 feet of my line wouldn’t shoot on a long cast! I got thinking of how to solve the problem of putting some weight in the base, yet keeping the inside totally slick and clean, with nothing to hang up on, and then it hit me — plywood. I went down to Home Depot and picked up a half sheet of 3/4 inch pressure-treated plywood. Get AC plywood that is good and smooth on the one side you will have facing up that the line will lay on. This pressure treated plywood is much heaver than normal plywood, and is perfect for a saltwater application like this, and adds just the right amount of weight. I’ve fished many times now with the bucket on my casting deck in twenty to thirty mile an hour winds and it stays put. Place the base of the leaf bucket down on the plywood; draw a circle around the base to give you the outside dimension. Then cut your plywood about an eight of an inch inside this line, all the way around, using a saber saw. After you make the cut, take some 80 or 100 grit sandpaper and smooth of the edges- actually round them a little in the process. This will take perhaps 15 minutes. Then all you have to do is to work the plywood down into the bucket, and you’re done! This should be a tight fit, so that it won’t come out. You’ll never need to get it out! If you screw up, you’ll still have enough plywood left over (with a half a 4 x 8 foot sheet) to make one more base. The leaf bucket is just the perfect height for a stripping basket, coming to just below your knees. You can strip naturally, and when positioned correctly, your strips go right into the wide mouth bucket, no problem. I’ve found that if I can get my first strip or two started in the bucket, then the rest of my strips go right in without me having to look where I’m stripping. This is important since you need to be getting all your strips in the bucket especially when the wind is blowing like hell, or you are excited by that one hundred pound tarpon that is bearing down on you! I’ve found that I use the bucket in a variety of ways and positions in the skiff. Obviously you want to use it up on the front casting deck and since I’m right handed, I normally position this to the left and a little behind my left foot. When the wind is blowing harder though, I often place it right between my two feet. It is important for you to move the bucket around in the direction you are casting. For example, if I’m in the bow, but casting off 90 degrees to the right, I’ll pick the bucket up and position it on the right side, between my legs and slightly in front of me. Here on the West Coast of Florida, where we are often using a bow mounted trolling motor, one angler can be up front, fishing and controlling the motor and another angler can fish very effectively out of the back of the boat at the same time. So I bring along TWO buckets! Fortunately these collapse and take up very little space in the bow compartment of my 17-foot Maverick Mirage flats skiff. I’ve found that a great way to utilize the bucket when moving from one fishing spot to another is to just hook my fly in the stripping guide of my rod, then stow the rod in the boat rod rack, leaving all the stripped out line inside the bucket. 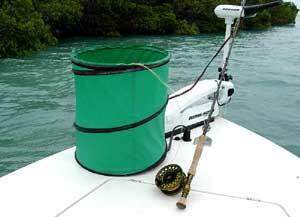 I then collapse the bucket and stick it up in the bow compartment, line and all. The line will come out under the lid of my bow compartment, but this has never damaged the line in any way. Another great way to use the bucket is when you are casting from the poling platform. Any of you that have tried this know what a problem you have with dealing with your shooting line back there. It wraps up around the prop, gets blown back and hooked around the steering wheel, or gets tangled around all the control cables to your motor. This can be a nightmare, especially when big fish are coming and you miss your first cast and have to restrip and make another cast in the wind. With the bucket, I simply get my feet planted wide on the poling platform and stick the bucket between my feet. I try to position it slightly forward, as far as I can go without having it fall off the platform. This works perfectly. If you are fishing on your own and want to stake out, there is no better way to spot and fish to fish than by anchoring up or staking out from the bow to keep the boat pointed into the wind to reduce wave slap, and then get up and fish from the poling platform. Now you can see those fish approaching your stern a long way away, and make some seriously long launches from up there. In late April this year I caught a 120 lb. tarpon while fishing off the poling platform while being guided by Boca Grande guide Austin Lowder. My other buddy Gerry was up front, casting from the bow. Needless to say, you don’t want to try this if you are bouncing around in big waves or if your balance isn’t good. Otherwise you could be taking an early bath!